This week’s pick is Photomath – Camera Calculator by MicroBlink Ltd. Photomath is an application that uses your iPad or iPhone’s camera to take a picture of math problems you would like solved. The amazing result is a detailed step-by-step answer neatly presented for your convenience. In addition, you can also use the recently updated math keyboard to edit or manually enter math problems you would like solved. Photomath currently supports arithmetics, fractions, decimal numbers, linear equations, equation systems and several functions like logarithms. More complex problems like integrals, trigonometry and derivatives are also supported but currently without detailed solving steps. Support for new math is constantly added as we aim to pack in more and more math knowledge. Photomath does one thing, and does it well. 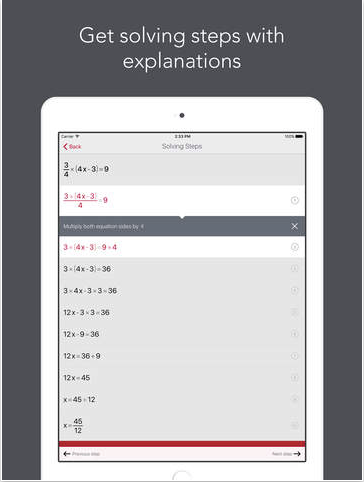 It reads and solves mathematical problems by making them easy and simplified. Here’s an App Store link for Photomath . 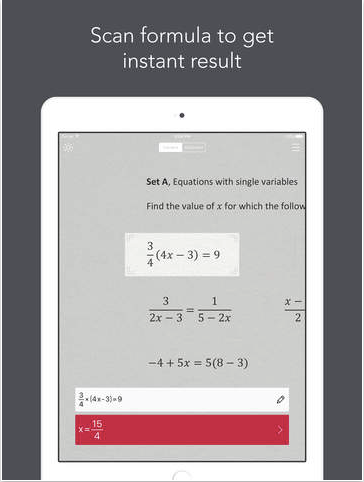 Compatible with iOS 7.0 or later, Photomath is designed for both your iPad and iPhone. You can download it today for free–or, if you would like to keep Photomath free in the future, consider one of (4) potential denotations to help support further developement.